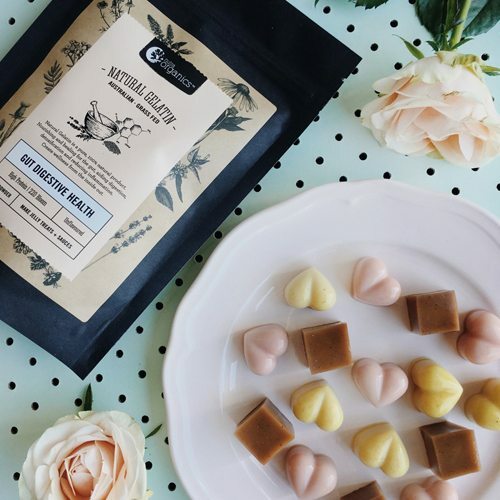 Love your gut with these yummy, tummy gummies! Get creative with the kids these school holidays with these yummy simple healthy treats you can make with them in the kitchen. Add your flavour: We used our Velvet Latte & Clean Protein Turmeric! You could try melted dark chocolate, or even some blitzed up berries! 1. Bloom gelatin by adding the water and gelatin in a bowl together, combine and leave for a couple of minutes. 2. Heat coconut milk in a saucepan and take off the heat just before it starts to simmer, then add to the gelatin and mix to allow to fully dissolve. Take care not to boil the coconut milk. 3. Add maple syrup for sweetness and your flavouring. 4. Pour into silicone molds. 5. Set in the fridge for 1 hour or until firm.